Sewing just got a little more interesting for me! 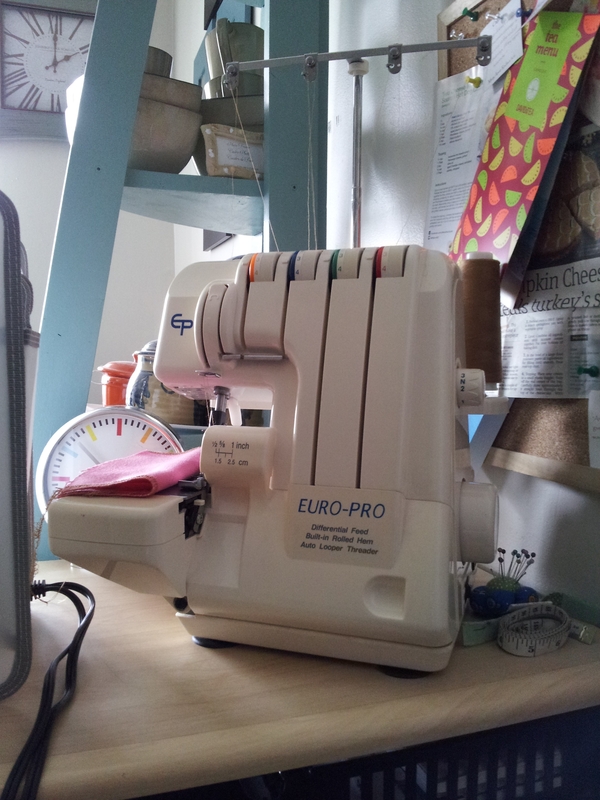 My very own Serger.!!! OMG. One of those machines I thought I would never figure out, use, much less own. But hey, times change right and here I am now a proud owner. One of my friends, an awesome woman, who at one point made some fabulous bags had this sitting in her basement for the past years. She had never used it and it was just sitting around. I was so thrilled when she said you can have it. Really…..me……a Serger….. Yes. 🙂 Thank you! Of course the day I picked it up I was up all night trying to figure out how to thread this thing. Finally with the help of my mom, a tweezer and a torch light we got it together. Phew! That was the biggest hurdle. But now I know how, I am good to go. Plugged it in, lights came on, and then I hit the presser foot. No idea what would happen, but it started to work and I was like aaaaaaaaaaaaaaah, it works! YES. This was the first thing that came to mind. My pieces can now have this added finish. I don’t need to be an expert to own one of these. I will make the best of it as I do my different projects. Sewing just got a little interesting with my new toy. No more “ratchet” ends. They will now look a bit more like this…….I am still working on settings and all that. Tuning it up nicely, but so happy I actually have this to add to my learnings. It’s been a great summer on the sewing front. I feel like I really stepped out in my sewing and I have learnt alot. Don’t kid yourself, I am still learning and I am not there yet, but I feel like I have inched my way out of many many many comfort zones in regards to sewing. But at least I am proud to say “yes, I can try that”. Thanks for following, encouraging and staying with me as the sew journey continues…..September is a refreshing month and because I want to go to the fabric store soon I will focus on these unfinished projects sooner than later! Just keep sewing just keep sewing, what do I do I sewwwwwwwwwwwwwwwwwww…. Next postScarf up, it’s September! Congratulations on the new serger! Many great things ahead. Keep it up! Oh such a happy day! I just love getting something new to me (sewing related especially)! It took me years before I bought myself a serger and I can’t imagine living without it now! Have fun! Thanks. I am really lucky to get started so soon I guess. It will help me learn it faster. Love it already.